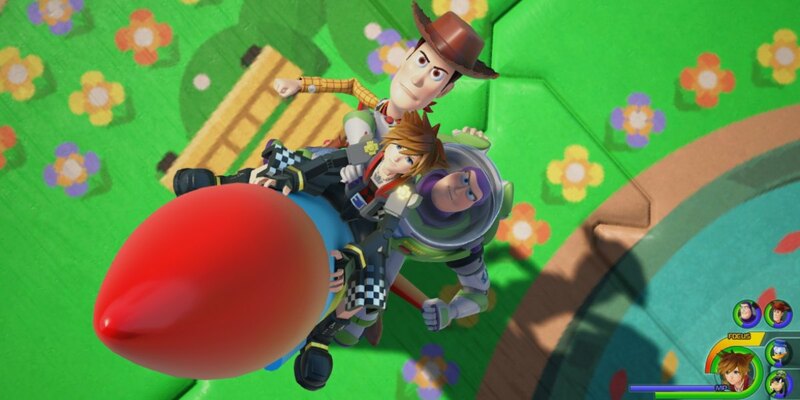 The Kingdom Hearts 3 worlds are bound to be the most in-depth out of any Kingdom Hearts game. 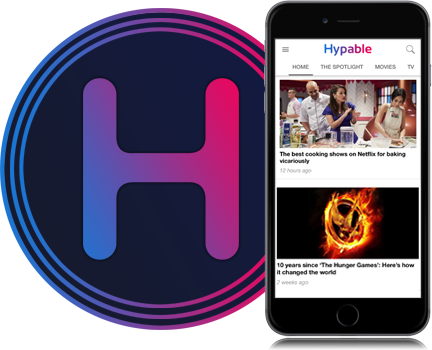 If you’re having trouble keeping track of the details, Hypable has your back. There are ten confirmed Kingdom Hearts 3 worlds thus far. If there happens to be another announced before the game’s January 29, 2019 release, we’ll make sure to update this guide. For now, here is everything you need to know about the plots, voice actors, and more of every confirmed Kingdom Hearts 3 world. Sora visits Woody and the gang sometime between Toy Story 2 and 3. It will be a completely original story, but well before Lotso’s evil influence. There is a boss battle against a heartless doll wearing bunny ears. Sora, Donald, and Goofy are all shrunken down to toy versions of themselves in this world. Not much has been shown of the story for this world, but we can piece together that it’s going to follow the plot of the movie fairly closely. Mother Gothel will be in the world, as will Flynn as he aids Rapunzel in her quest to see the floating lanterns on her birthday. 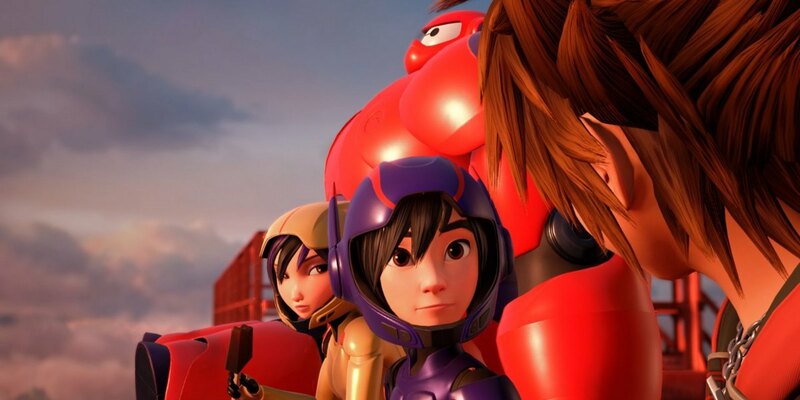 The Big Hero 6 team is all gathered up by this point in the story, but there doesn’t seem to be any sign of Callaghan. Instead, an original story, perhaps of the team fighting off the dark Baymax seen in promotional material, will take place in this world. There is a cutscene where, sitting on top of the Golden Gate Bride with the Big Hero 6 gang, Sora transforms into Roxas. 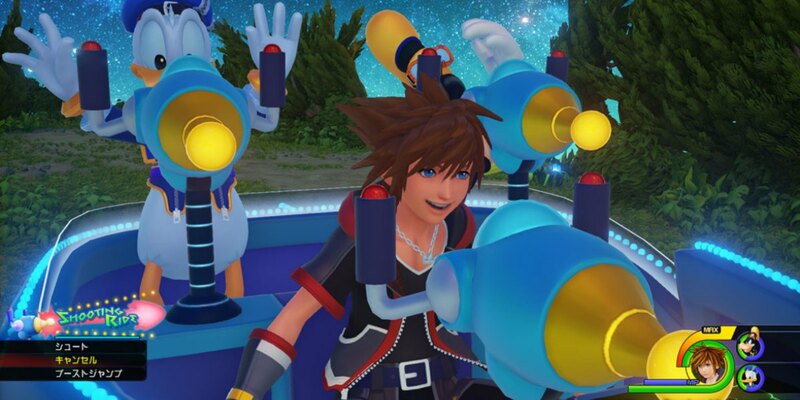 Sora has been seen fighting the Rock Titan in the rain in his Kingdom Hearts 2 outfit for some time now, placing this world at the beginning of the Kingdom Hearts 3 worlds. 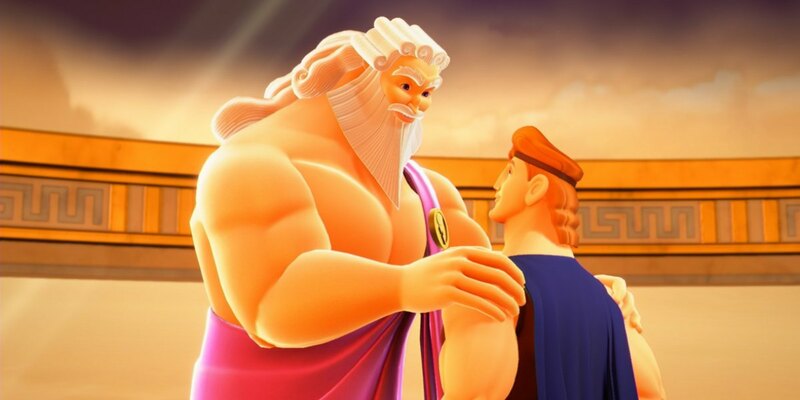 Zeus makes his first Kingdom Hearts appearance in this game. Hades returns as an antagonist, along with Maleficent and Pete. 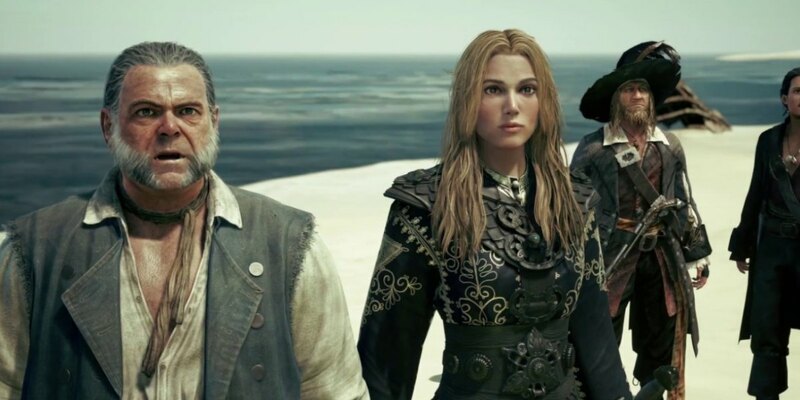 Kingdom Hearts 3 will focus on the story of Pirates of the Carribean: At World’s End, which is the third installment in the Pirates series. 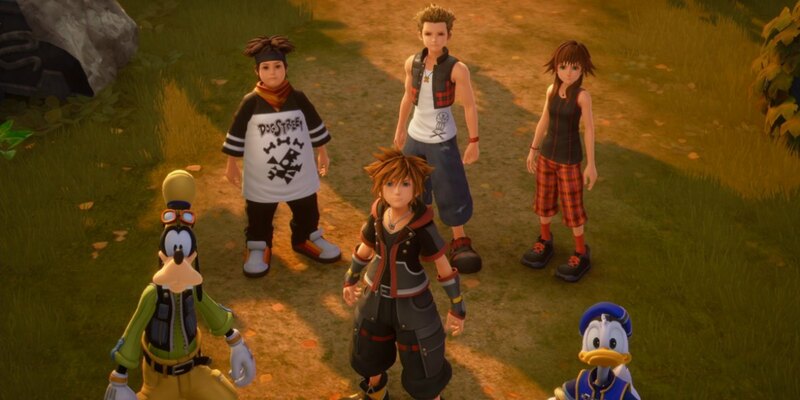 Sora, Donald, and Goofy actually dress for the world this time around, making them look a lot less out of place amongst the lifelike characters. The trailer showed off Jack’s ship returning to his crew, mimicking the same scene in the movie. Luxord is back in this game’s Pirates level. In this world, Elsa is tempted by the darkness by a revived Larxene. 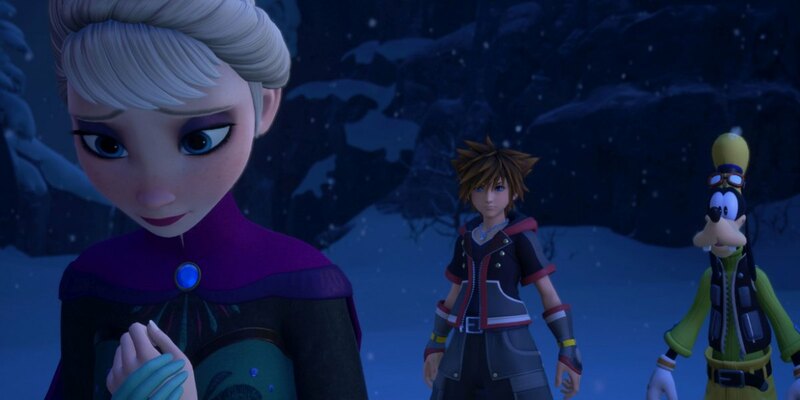 Sora interacts with both Anna and Elsa, and even has a conversation with snowman Olaf. Elsa is in the midst of running off after Coronation Day, and Anna is with Sven in an attempt to save Elsa and end Winter. We’d imagine that the Marshmallow monster boss fight is the prelude to perhaps a dark Elsa fight. The plot of the original Monster’s INC. transpires in the trailer. Boo is in the monster world, and Sora will have to try to hide her from other monsters, while learning with Mike and Sully that laugh power is even more powerful than that of screams. Vanitas confronts Sora in this trailer, demanding to have the other half of himself back from Ven. 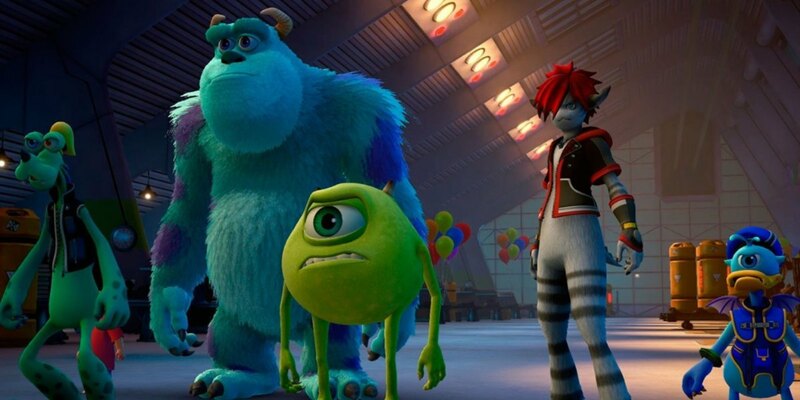 Sora, Donald, and Goofy transform into monster versions of themselves in this world, akin to how they did so in The Nightmare Before Christmas world Halloweentown. Sora returns to the Hundred Acre Wood, likely to complete some fun mini-games while catching up with his old friend Pooh. 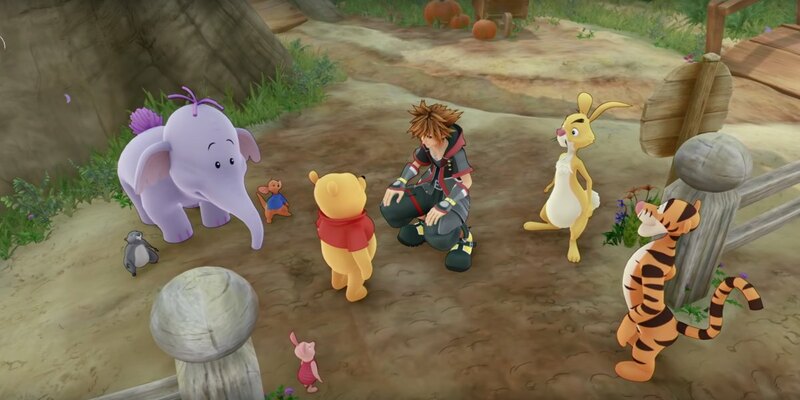 Lumpy the Heffalump will make his debut in Kingdom Hearts 3, with most of the other characters from the previous Kingdom Hearts Winnie the Pooh worlds confirmed as making their return. In the below gameplay trailer, a mini-game in Rabbit’s garden where Sora shoots vegetables in a pattern to clear the playing field was showcased. Sora is reunited with Hayner, Pence, and Olette in the real Twilight Town. Together, the gang is going to attempt to recreate Roxas from the data that Ansem the Wise left in the computer linking them to the Digital Twilight Town. Sora is seen having a confrontation in front of the Mansion with Ansem Seeker of Darkness and Xemnas, likely placing this content as endgame material (although it has been stated that it will also serve as the tutorial world once more). Roxas is seen at these gates as well, confirming his canon return in Kingdom Hearts 3. Sora and the other Keyblade masters will likely gather here for meetings with the wise Yen Sid. Expect a lot of monologuing in this world, and hopefully some useful information on how to defeat the Denizens of Darkness. 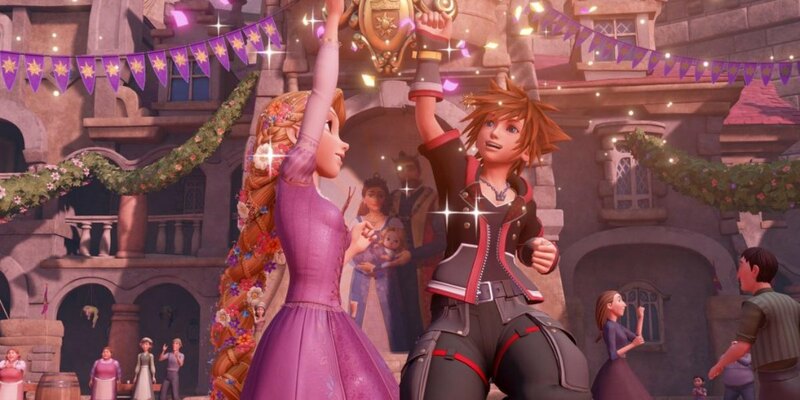 Kingdom Hearts 3 releases on January 29, 2019 for Xbox One and PlayStation 4.